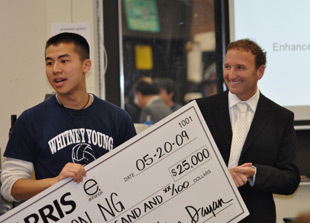 In May of 2009 Enhance Educational Foundation awarded a $25,000 scholarship to an outstanding Chicago Public School student Brandon Ng, a senior at Whitney Young, who submitted transcripts, letters of recommendation and an essay on "what do you dream of becoming." Brandon Ng has participated in the Medical Academy of Education to Careers (a program through CPS) for the past four years. Through this demanding program Brandon and his peers learn about the medical field, are challenged through rigorous course curriculums and gain real world experience through internships with hospitals, pharmacies and medical practices. Additional scholarships in the amount of $3000 were awarded to the four runner-ups. The 2010 scholarships will be funded by the event, Operation Enhance at Lumen on October 22, 2009.